Every entrepreneur has experienced the struggle of having too many things to do in too little time. You’re juggling meetings, projects, tasks, and communication (not to mention personal and family time), and before you know it, your calendar is packed with things to do. On one hand, it’s good to be busy (there’s scientific evidence that busy people are happier), but at the same time, there are serious disadvantages to having a packed schedule. Stress. Sometimes it feels like just looking at a packed calendar can increase your blood pressure. Chronically high stress comes with a number of physical and mental health complications, so don’t take it lightly. Rigidity. When your schedule is too full, you won’t have room for emergencies or other things that pop up unexpectedly. A looser schedule makes you more flexible. Failures. If you schedule too many appointments and tasks, you’re going to miss at least some of them—which can damage your reputation more than postponing them proactively. What’s the solution? 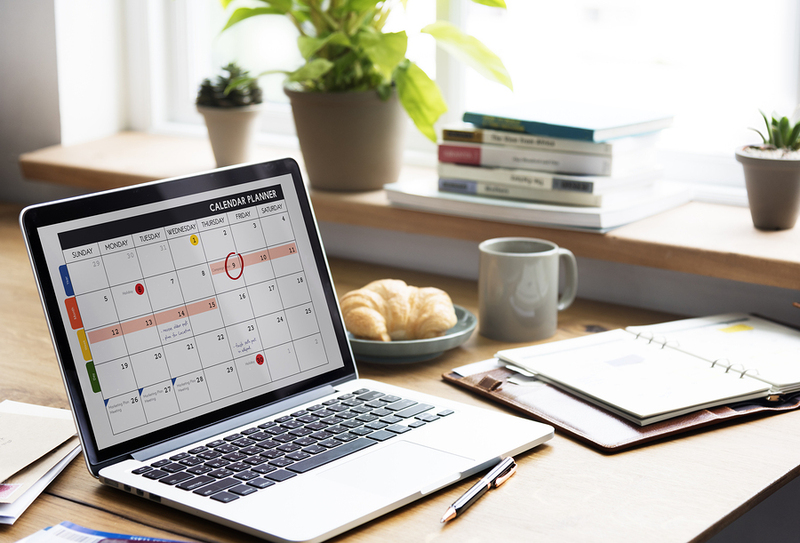 Keep a leaner schedule—that means you should have fewer scheduled events, more efficient organization, and more value and necessity for each event you schedule. Your first job is to stop using multiple calendars at the same time. Referring to multiple calendars at once, including any sticky notes you have laying around the office, will increase your chances of double-booking, feel confusing, and make your schedule feel more chaotic than it actually is. Choose one calendar service (it doesn’t have to be fancy—Google Calendar works fine for many professionals), and use it to organize all your scheduled events. Meetings can be an effective way to brainstorm as a team, exchange information, and get up to speed on each other’s progress. But face it—they can also be major time wasters. Obviously, you can’t eliminate meetings from your schedule entirely, but you can be more selective about which ones you schedule. Reserve space in your calendar for the meetings that actually matter, and when you schedule them, make sure there’s a specific agenda and ideal attendees in mind so you can make them worth your while. Whenever you schedule an event on your calendar, set a priority level for it. You can use any system you want, but one option is to color-code your events based on how important they are. For example, red events could be ones that can’t be rescheduled and must be attended, yellow could be events that should be attended but may be postponed, and green could be easily replaceable events that may be skipped without incident. This will help you manage schedule conflict in the future, and can help you visualize your daily needs better. When you have two meetings going on at the same time, it’s tempting to schedule both in the hopes that you can switch from one to the other, or that one may be canceled eventually. However, double-booking is a fast way to clog your schedule and a surefire means of stressing you out. Stop double-booking entirely. When you encounter a schedule conflict, make an immediate decision about which event you’re going to prioritize, and wipe the other one from your mind. Parkinson’s Law is an interesting psychological phenomenon that states that work tends to expand to fill however much time is allotted for its completion. In short, if you give yourself an hour to hold a meeting, it will take an hour, but if you schedule it for half an hour, it will take half an hour. Obviously, this isn’t a strict rule, but there is some truth that setting tighter timeframes can help you get more done in less time. Schedule less time for meetings than you think you need—it will help you get to the point faster. Chances are, you aren’t the only person making plans for yourself. Whether you have an assistant, a partner, or coworkers who demand your time, other people are going to be scheduling things on your behalf. If you want to keep your schedule leaner and keep your team on the same page, find a way to share your calendar with them. This way, everybody relevant to the conversation can see your schedule at the same time and reference it before they volunteer you to attend a meeting or special event. You can also dramatically cut back on scheduled events by delegating some of your responsibilities to others. Is there a semi-important meeting that you just don’t have time for this week? See if one of your employees can attend in your stead and take notes for you to review later. Is there an industry conference that your company needs to be represented at? See if one of your salespeople can lead the charge. This is especially helpful when managing schedule conflicts, or making room for higher priorities. You can also keep a leaner schedule by prioritizing space in your calendar. You don’t have to fill every hour with business and professional requirements, nor do you have to reserve your personal time for whatever gets left over. Proactively schedule breaks for yourself, including lunch breaks, vacations, and hard stops at the end of the day. Maintaining a healthier work-life balance with more personal and family time will reduce your stress levels, and counterintuitively, can actually make you more productive. Resist the urge to dominate your life with work by making time for yourself a priority. With these strategies, you can keep a much leaner, more efficient schedule. You’ll be more productive and more efficient in your work, but more importantly, you’ll be less stressed and a more positive force in the business world. You won’t be able to roll out and enforce all these strategies overnight, but if implemented over time, you’ll likely notice a significant difference in your demeanor, your working habits, and even your mood.